Three authors, six cities, six weeks. 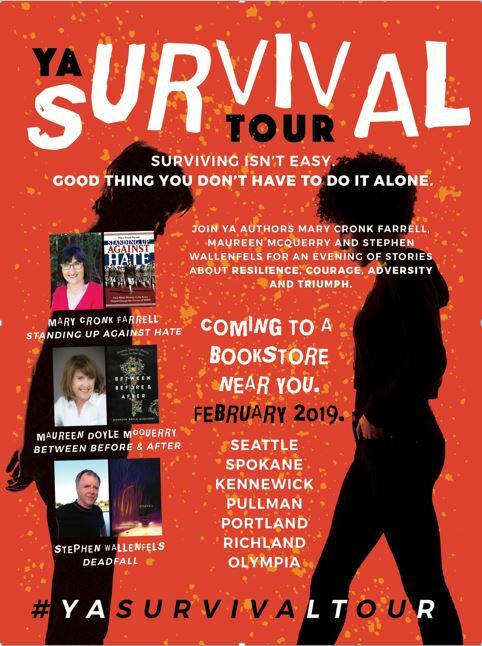 If you live in the NW we'll be visiting a bookstore near you with our latest releases, book and movie survival trivia, prizes and stories of resilience, courage, adversity and triumph. Hope to see you soon! ​Click names to visit their websites. ​Austin Public Library, Manchaca Road Branch, 5500 Manchaca Rd. ​Fannie Sellins faced off against powerful corporations, galvanizing workers to strike for fair pay and safe work. She confronted anti-immigrant prejudice and advocated non-violent action. When company-hired gunmen threatened her life, she refused to leave the picket line. Fannie died in a hail of bullets in broad daylight before a crowd of witnesses. No one was ever brought to justice for her death. From agents to editors to readers—your first impression key. Whether you’re writing a novel, nonfiction, short story, graphic novel or picture book, your first few pages must introduce character and conflict, provide clarity and suspense, make a promise and hook your reader. Join us for this progress-focused interactive workshop. Bring the first 750-words of your manuscript or book proposal and we’ll scrutinize language and structure for these essential elements, tackle exercises to improve voice and tension, plus, clarify place, time and mood. Chatham University, Mellon Board Room, Woodland Rd. Event is free, but you must register. For more information and to register, click here. Brookdale on 57th and Regal. PURE GRIT Book Discussion Group. Everyone Welcome! We'll be talking about the WWII POW nurses featured in my book and how they survived three years in Japanese prison camp. Do you have a military nurse in your family tree? Come share your story. I'll be meeting with Emergency Room Nurses on retreat to reflect on their vocation and bond with one another. Every day these nurses care for children who come into the ER, often in critical condition. My part is to share the courage, resilience and commitment of the POW nurses I researched for PURE GRIT. I'm honored to be a small part of this effort by these nurses to process the demands of their job and return to their important work with renewed purpose. Come meet Kay LeClaire, Mountain Climber Extraordinaire featured in my book JOURNEY TO THE TOP OF THE WORLD. Kay summited the highest mountain on each of the seven continents, Mt. Everest at age 60. Writing a nonfiction piece, short or long form, often requires tenacity. The authors will offer solutions to difficult or dead-end research and cover how to deal with mistakes, unpracticed craft, and unwieldy narrative structure. Their publishing credits include a wide range of essay, biography, history and nature literature.